Folio photo #06: 10 Downing Street, November 2001. 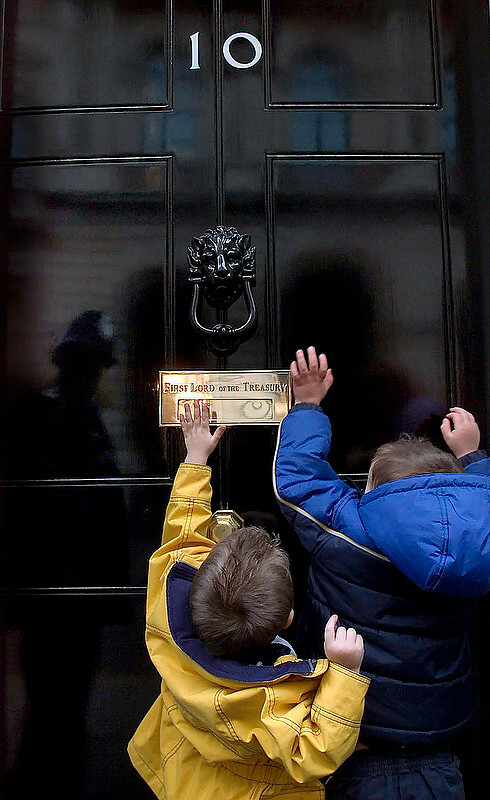 Children from a Leicestershire nursery school try to hand in their petition against closure to No.10 Downing Street. This was a very ordinary story about yet another petition being handed in at No.10 which became extraordinary when the Police Officer on duty allowed the two children to try to knock on the door and then stood back and laughed as they kept trying. It was a very cute moment on a day where the world’s media were not watching and the reflection of the officer in the shiny black door makes this a favourite picture of mine. They never reached the door knocker and so the officer eventually helped them out by knocking it for them.